Here you will find the perfect combination of space, peace and quiet. In the large grass garden (about 3000 sqm) with fruit trees, you will definitely find a place to relax on your lounger. If you look around you, you have a panoramic view of the beautiful countryside, the surrounding forests and picturesque mountains peaks. Enjoy a game of jeu de boules, with enclosed private swimming pool or a delicious meal in the conservatory. The house exudes a pleasant and relaxed atmosphere; it is completely and lovingly decorated, the paintings and collections make it into an attractive whole. 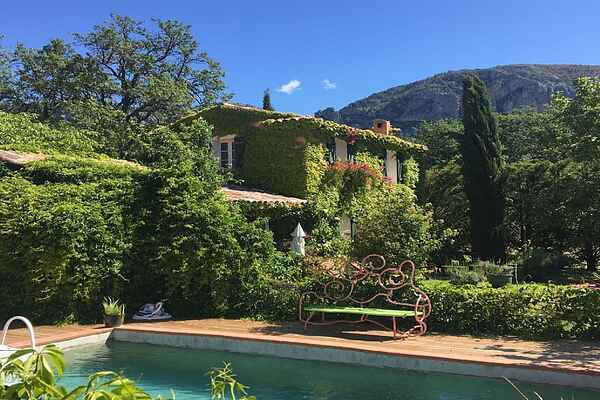 This villa is located in Moustiers-ste. Marie (3 km). Just 3 km from the Lac de Ste. Croix. Even closer is the smaller lake 'Le Petit Lac'. Moustiers-Ste. Marie is an ideal starting point to explore the 21 km long Grand Canyon du Verdon, it is the place where the north and south route come along the biggest limestone reef in Europe. The canyon is best admired on foot, for daredevils a trip by canoe is an option. The best route by car is towards Castellane (Route des Crêtes), it runs along spectacular lookouts.